In the heart of Provence, Corinne and Olivier welcome you at the Clos de la Cigaliere, in the country, between Isle sur la Sorgue and Avignon. 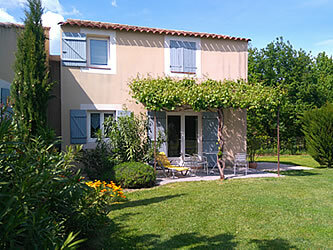 Located in a separate part of the house, with landscaped garden, the 50sqm cottage is designed for 2 or 3 persons. On the ground floor: a large air-conditioned living room of 25sqm with a lounge area, TV, DVD player, wireless internet and radio, a fully equipped kitchenette with oven, microwave, dishwasher, washing machine, fridge-freezer, cooking plates, coffee maker, kettle, toaster, iron and ironing board. Direct access to the terrace shaded by a pergola. Upstairs: large air-conditioned bedroom with a king size bed (that can be splitted into 2 single beds) and a single bed, a shower room, hairdryer and separate toilets. A child bed is available.